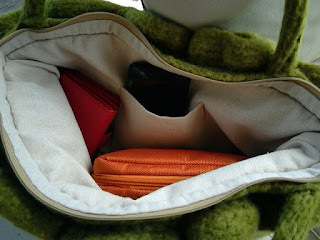 Now in case you are a regular reader of my blog and are wondering what happened to bags nos. 1 and 2, do not worry, I didn't really post about them and you haven't missed much. 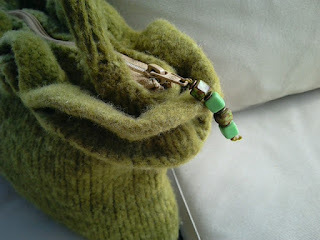 Here is a photo of bag no. 2. 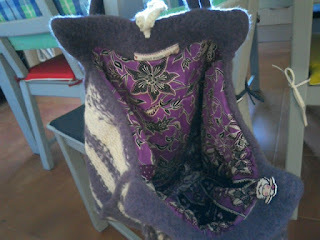 This is a perfectly usable bag and since I am definitely still experimenting it was a very useful learning project. Now Bag no. 3 is also a learning project. But the making of it was less aimless and by chance than bag no. 2. The Brief: I want to use as much of the local fleece as possible in my bag. I also want the bag to reflect the local area or my life here in some way. I want the bag to be classy/sophisticated. I want the quality of the sewing to be super high, making it very 'couture'. Finally, I want it to be obviously a work of art more than simply 'craft'. Not to downgrade craft work in any way - I've been a craft worker for many years, but now I want to stretch myself a bit. It's a journey so please bear with me. The fleece is 100% local merino cross (the cross is something ancient, Spanish and unknown to my shepherd though he did make a guess - only I couldn't pronounce it never mind spell it!) 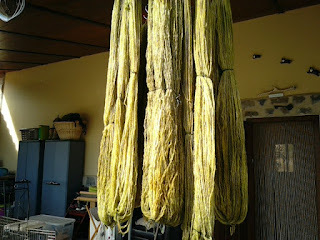 It's dyed with an acid dye using vinegar as a mordant. 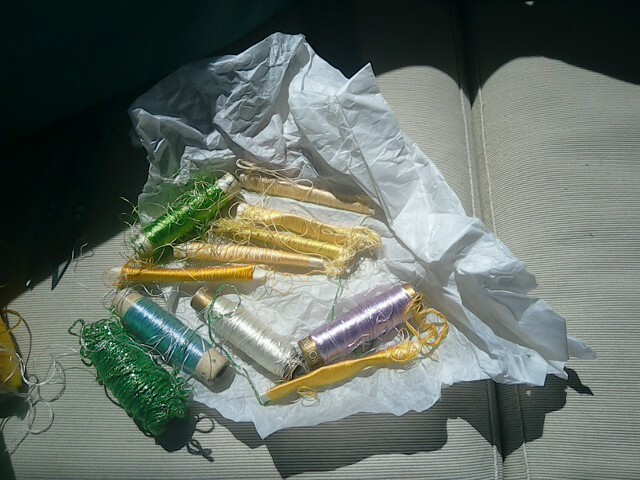 The embroidery is both cotton and silk, the silk threads bought from a flea market here in Spain. 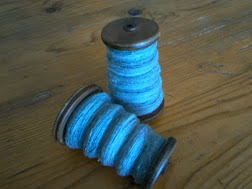 The fleece was first washed and combed, then spun using a vintage Ashford Traveller wheel. The bag was knitted up HUGE then washed at 90C in the washing machine along with a towel to help the felting process. After drying I set about deciding how to decorate it. I gathered a few flowers from the finca and took photographs. There are so many flowers at this time of year I could go crazy and it would certainly make a fun bright bag if I tried to include them all but I wanted sophisticated so I decided less is more. 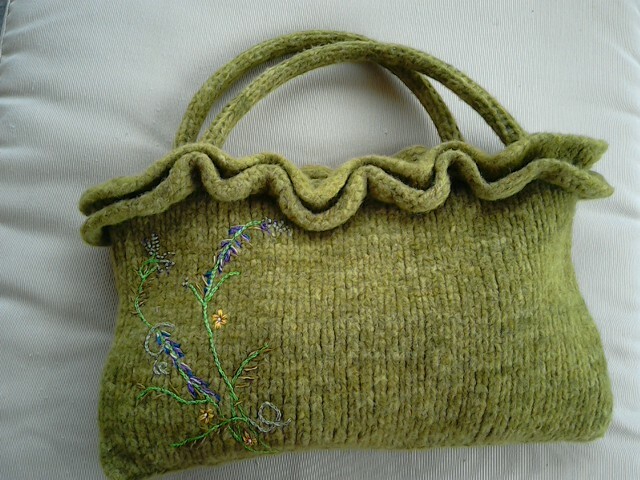 There is a local tradition of embellishing peasant style blouses and felted skirts with bright flower embroidery which I might emulate at some point in the future but it isn't sophisticated so it isn't for this bag. 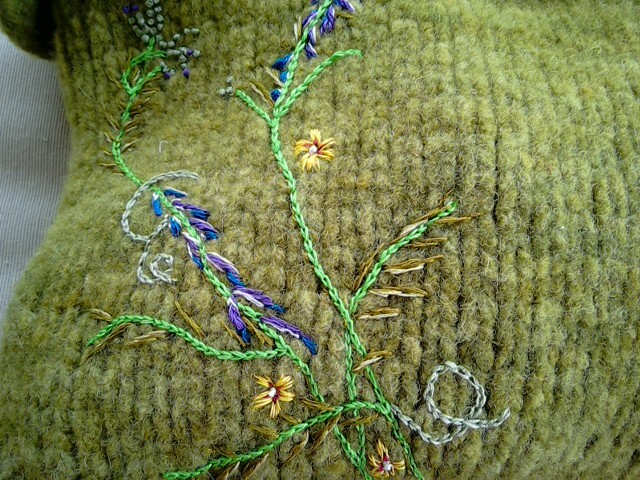 Nowadays most of the costumes are machine embroidered. 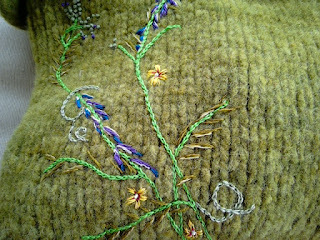 Fewer and fewer people know how to do the embroidery and even fewer have the time. 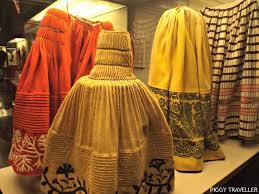 Even though the modern versions are made by machine they cost hundreds of euros. Just a little snippet of information for you - there are not so many surviving examples of the traditional costume as folk used to be buried in them. There are still a few that have thankfully found their way into museums and which are a wonderful resource for people like me. 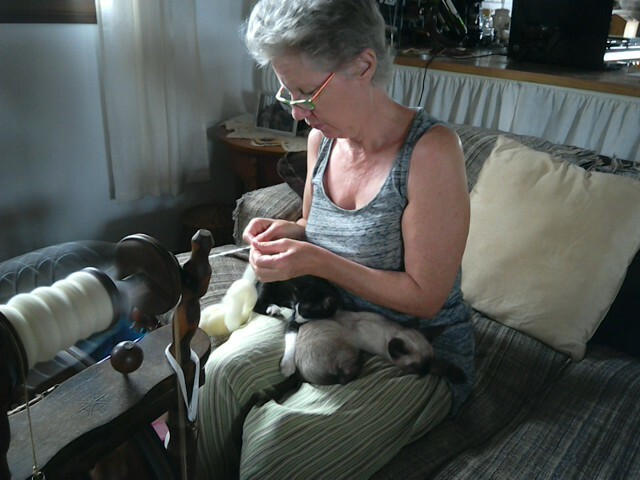 And the skirts are felted.. local fleece? This I don't know.. yet! I was pretty chuffed with it at this point but then I did the lining. I chose linen. And i used interfacing to give it a bit more body. 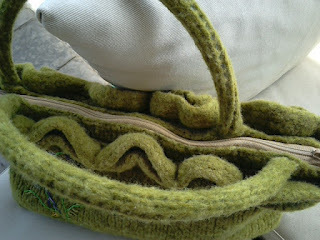 It made it very bulky and tricky to sew onto the bag. I ended up wrestling with it for an entire day, three rows of tiny pin point hand sewn stitches to secure it to the bag, and then discovered that I had distorted the bag and now the handles don't line up. It is not correctable. It is annoying but then this is a learning project and in that respect it has fulfilled the brief! I learned a ton of stuff. Where it has fallen short I know I can fix next time. It is usable.. just. The misaligned handles are not comfortable to hold - it feels wrong. But I shall test drive it for a month or two to see how well it wears. 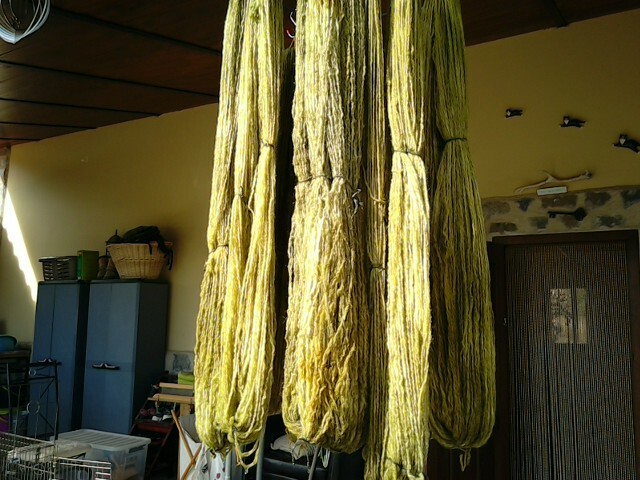 I suspect the wool will pill with frequent use, this is probably unavoidable to a certain extent, though there are spinning techniques that are supposed to minimise that.. something to think about as I am washing the next load of fleece, which is due very very soon. 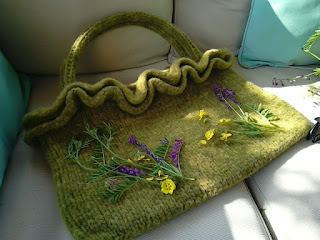 So many ideas for bags.. so few hours in the day! 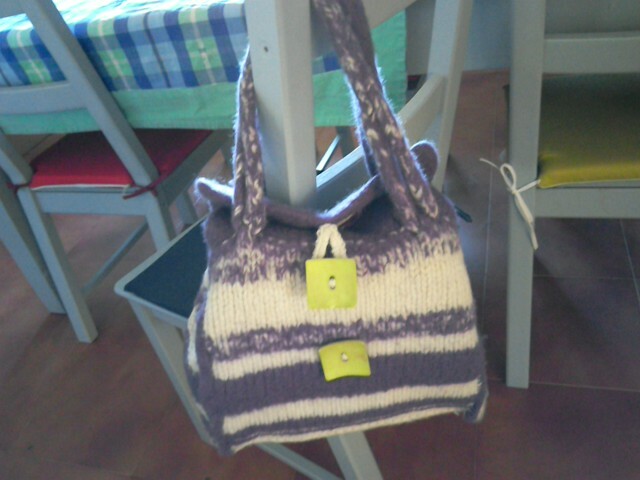 I love the bag, it's a shame about the handles but it was definitely a learning experience for you. You'll iron out those kinks in bag #4! !